A century ago, before the construction of Fenway Park, there were two major league ballparks side-by-side in the south of Boston. And I mean truly side-by-side. Of course, it is not that rare in baseball history to have had National and American League parks in close proximity. Over the years there have been many major league neighbors. 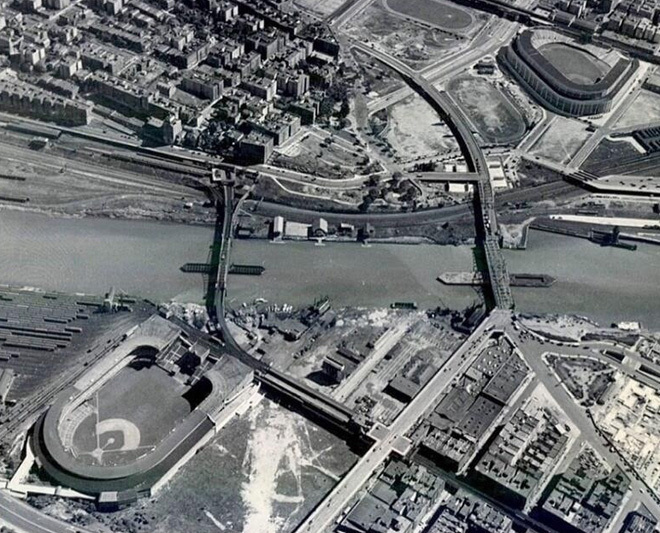 The Polo Grounds and Yankee Stadium were separated by little more than a river. 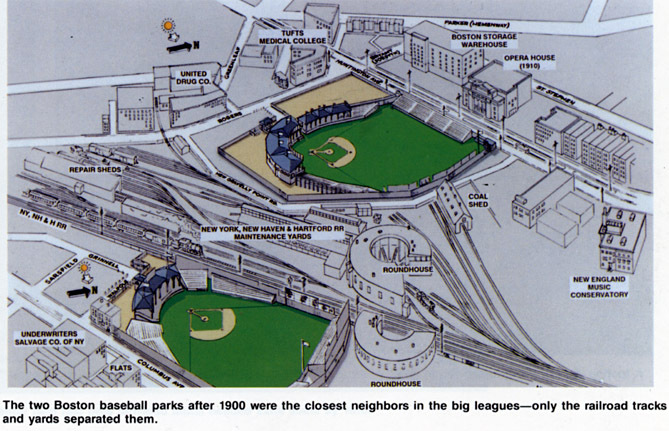 Shibe Park and the rickety old Baker Bowl were on the same Philadelphia street, separated by only a few city blocks. 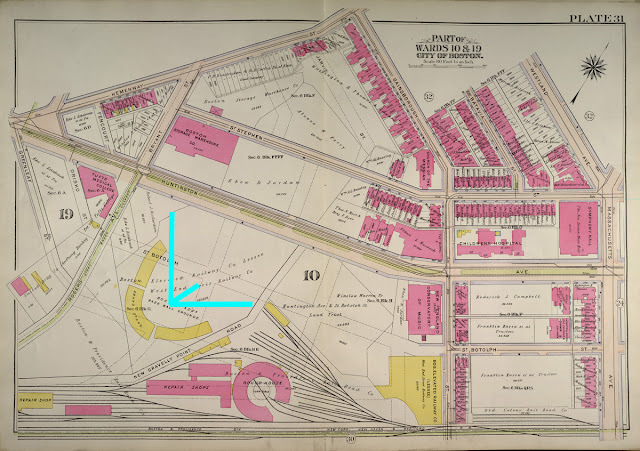 But the distances between those parks seem like light years compared to the space between South End Grounds, home of the National League team we now know as the Braves, and Huntington Avenue Grounds, the pre-Fenway home of the Red Sox, who were known earlier as the Pilgrims. 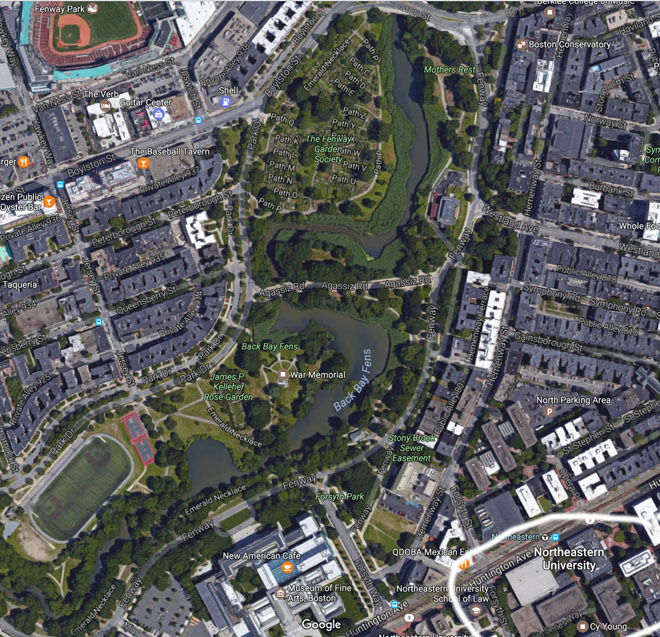 Operating together from 1901 to 1911, the two parks were separated only by some railroad tracks. As your eyes continue leftward, you will see the outfield fence and a portion of the bleachers. In the full-sized version you can clearly read the outfield billboards in both parks. You will note in the picture that the fans are forming a ring in the outfield. This was the standard procedure at Huntington for overflow crowds, which happened frequently, because the seating capacity in the park was capable of handling only about a third of the people who showed up on the busiest days! That disparity is the main reason why Fenway Park was built in the first place. Cutting off the outfield area didn't really present much of a problem for game play, since balls rarely flew into even the shallowest reaches of the stands in the deadball era, so they would certainly not reach the center field fence, which in that park was 530 feet away at its most distant configuration. Many deadball players couldn't reach that with their two longest hits added together! 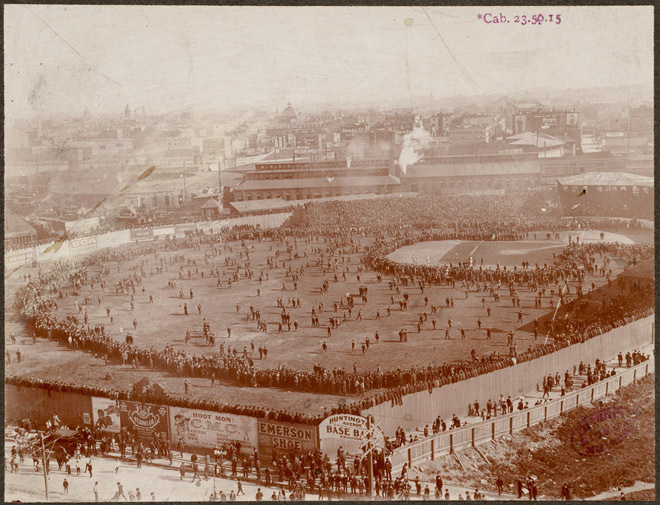 The image below, again available in ultra-high resolution with a click of the mouse (it's so large you'll have a delay in the download, but it's another must-have for collectors), pictures a game between Boston and New York in 1904 and shows just how roomy the stadium was. The crowd forming the ring is more than 100 feet behind the center fielder, yet there is still a vast distance between those fans and the others back by the fence. You can't get an idea from the thumbnail of just how much detail is available in the full image. The quality of the image is so spectacular that the individual fans closest to the camera on the far left could be clearly and easily identified. I don't know anything about the history of photography, so I had no clue that the photographers of 1904 possessed the technology to produce such an image. And that image, impressive as it may be, is not my favorite of the group. The picture that inspired me to research and present this article was taken on Saturday, August 5, 1911. It was the last year that the Red Sox would play on Huntington Avenue, and the great Ty Cobb was in town with the visiting Detroit Tigers. 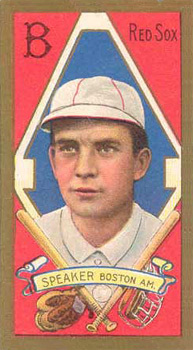 Cobb was on his way to a spectacular season, and was the league's ultimate drawing card. The game set an all-time attendance record, not just for this park, but for any park in baseball history to that date, as reported in this article in the next day's Washington Post. The attendance of 33,904 may not seem impressive in 2016, but it placed a significant strain on a park with an official seating capacity of 11,000! As seen in the image below, the fans were jammed in everywhere, many of them balanced precariously on the fences. Once more the full-sized version is available with a mouse click on the image above, and is required viewing for anyone curious about baseball in America a century ago. As identified on the scoreboard, the game action is taking place in the bottom of the second, with the Red Sox at bat. 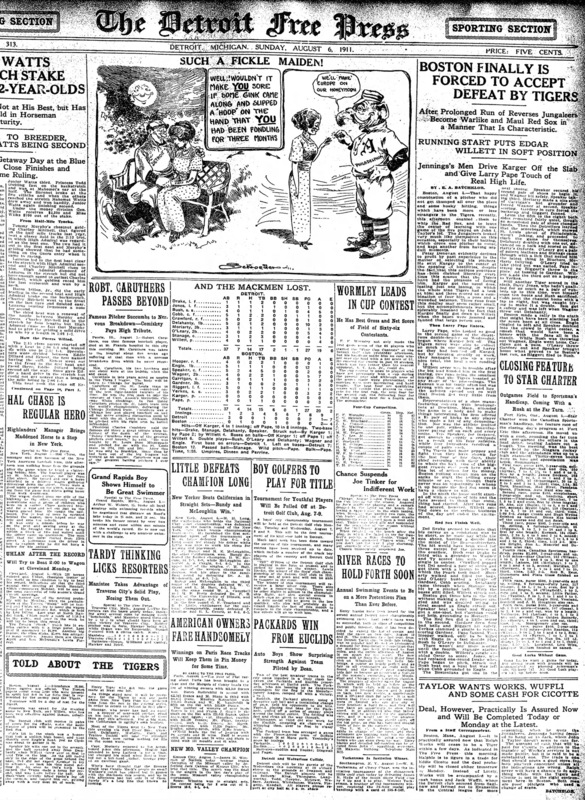 A complete account of the game, including a box score, is available from the next day's edition of the Detroit Free Press. The visiting Tigers, who were chasing the powerful A's for the league leadership, took the game 7 to 4, despite four hits from Boston's star, Hall of Famer Tris Speaker, who was generally considered the best defensive center fielder in history until Willie Mays came along. The opposing center fielder, pictured playing his position in the photograph, is the legendary Ty Cobb, who had two hits that day while hitting in the third spot in the line-up. One of his hits knocked in the game's first run, which put the Tigers ahead for good. 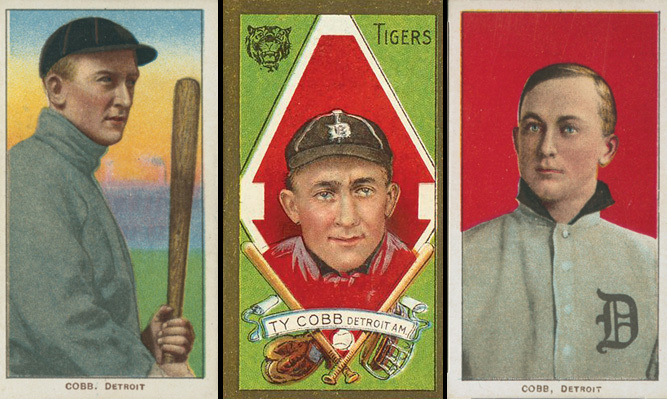 Cobb was on his way to the best season of perhaps the greatest career in the history of the game. In a unanimous vote, he would win the Chalmers Award as the league's best player. He batted .420 and led the league in doubles, triples, runs scored, runs batted in, stolen bases, and just about anything else you can think of except home runs, where he had to settle for second place behind Home Run Baker. The Tigers' right fielder and clean-up hitter was Wahoo Sam Crawford (right), another great Hall of Famer, who once led the league in homers, but specialized in triples, a category he led six times despite competing directly against Cobb. Crawford still holds the all-time record for the most triples in a career, and probably always will, with 309. (Cobb is second.) Crawford, headed to a season mark of .378 with 115 RBI, also had two hits that day. Playing first base and batting fifth for the Tigers was Jim Delahanty, brother of another great Hall of Famer and a solid star in his own right. Delahanty batted .339 that year and knocked in 94 runs. It was the best of his 13 major league seasons. Despite all that talent, the visiting Tigers were to finish a dozen games behind the Philadelphia A's that year. 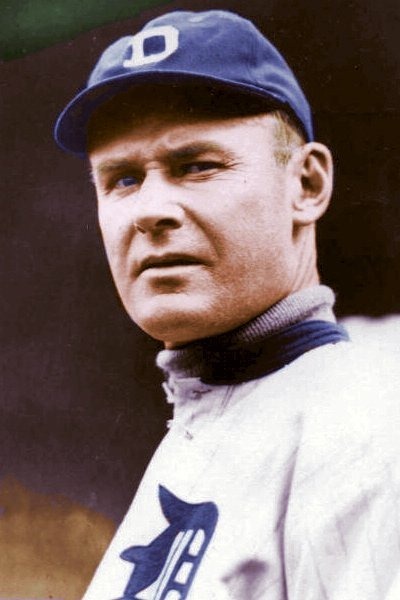 While the Tigers were about equal to the A's in offensive firepower, they could not match the great pitching of Connie Mack's Philadelphia team, which featured two Hall of Famers in the rotation and a third pitcher who won 28 games! The A's allowed fewer runs than any other team, while the Tigers finished second-last in that category. In fact, the Tigers were actually on the way downward in 1911 after trips to the World Series in 1907-1909. Despite their great hitting, they would not win another American League pennant until 1934. The hometown Red Sox, although mediocre in 1911 at 78-75, were headed in the other direction, building a powerhouse that would win the World Series the following year on the strength of an epic season from their pitching ace Smoky Joe Wood, who would compile an astounding 34-5 record in 1912. When Wood developed arm troubles, the mighty A's would bounce back to win the pennant in the following two years, but when financial pressures forced Mack to sell off his best players from the A's after the 1914 season, the Red Sox became indisputably the best team in baseball in the late teens. Unfortunately for the Boston partisans, the Sox fell deep into the doldrums after they would sell a certain young pitcher-outfielder named George Herman Ruth to the New York Yankees, thus bringing the so-called "curse of the Bambino" down upon their heads. Whether they were "cursed" or not, the fact remains that, after winning the World Series three times in four years (1915, 1916, 1918), the Bosox would not win another in the next 85 Octobers. Without sufficient seating to accommodate the burgeoning crowds of the increasingly popular national pastime, and heading into the age of the automobile without a parking lot, Huntington Grounds was obviously not going to be anything more than a temporary home for the Red Sox. 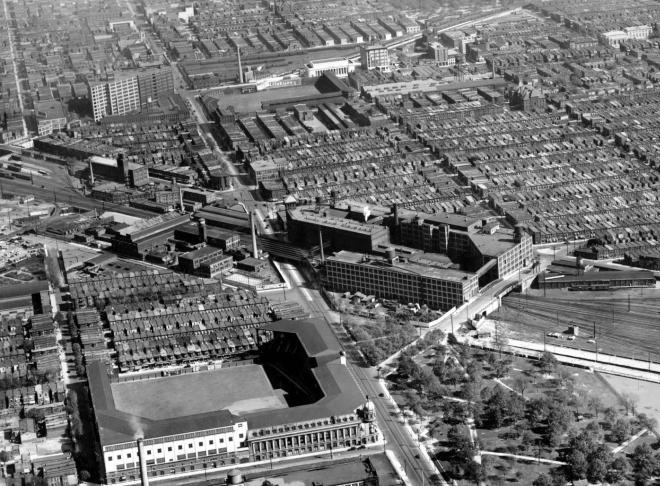 When Fenway Park was ready, the Huntington Avenue ballpark was soon demolished, and the land eventually became the site of Northeastern University. The 2016 image below is positioned at approximately the same orientation as the picture above from the 1911 game, showing the same part of Huntington Avenue and the parallel railroad tracks. 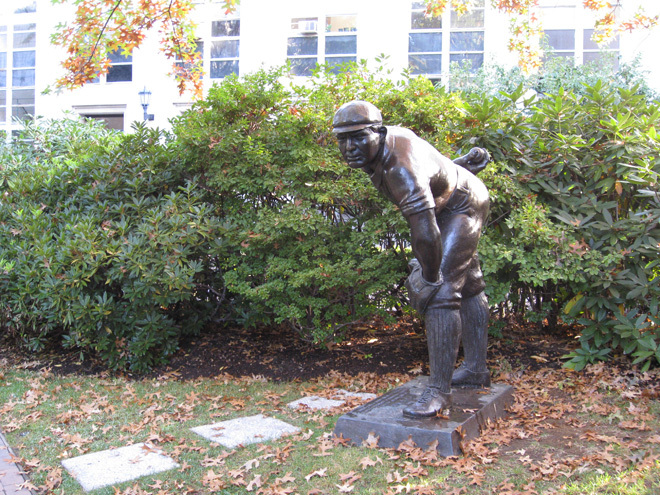 You may notice that the center of the university contains a label that says "Cy Young." This refers to a statue of the famous hurler which has been placed on the exact location where he stood to pitch in the old ballpark. Cy, the winningest pitcher in history, was an important cog in the Boston team which won the very first World Series in that very location. The 1903 Boston "Pilgrims," champions of the upstart American League, which was then only three years old, were able to defeat the favored Pittsburgh Pirates of the long-established National League in a "best of nine" series. Despite falling behind three games to one, it took the American Leaguers only eight games to defeat the Pirates, with their fifth and final win coming at home. Cy Young won 28 games in the regular season that summer and added two more victories in the World Series. He was also one of the team's best hitters, posting a sparkling .321 batting average during the season. His totem is not isolated in that college courtyard. The exact location of home plate is also marked, and Cy still faces it appropriately today, and perhaps will until the very end of days. Meanwhile, baseball in Boston continues not so far away from that spot. 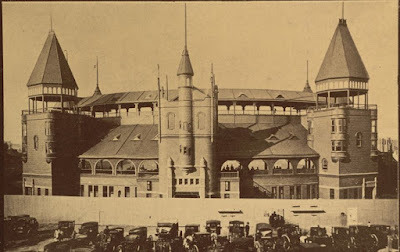 Fenway Park replaced the Huntington Grounds less than a year after the 1911 game pictured above, and it is still in use today, a welcome reminder of America's and baseball's gentler past. 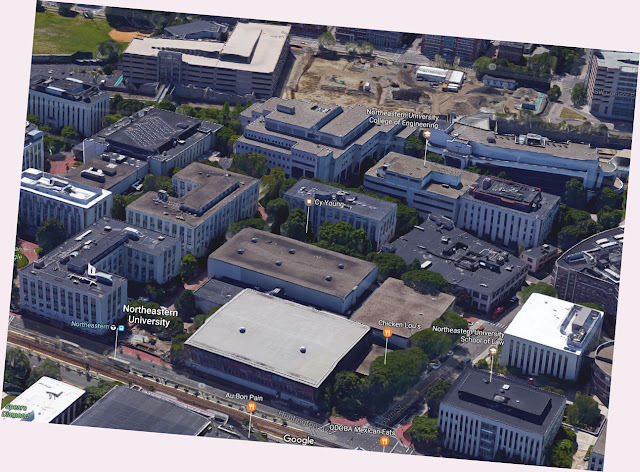 The satellite image below shows Northeastern University, where Huntington once stood, on the bottom right. Fenway Park is seen on the top left, only about a half mile away. Whither the complete game? And why? Who are the great clutch hitters of modern times? What if Williams and DiMaggio had traded places?